Concrete sleeper installation marks the final stage of erecting a retaining wall. It also brings mixed feelings. On one hand there is the hope of a job that is nearly done. On the other hand…you hopefully 5 fingers left at the end of the job! There is also the joy that comes with just ‘sliding’ in those concrete sleepers as the last part of the process. But with that comes up to 120kgs of sleepers to lug from pile to post! I recall arriving at a site to see four body builders looking notably shell shocked. Their job? Putting concrete sleepers into the retaining wall they were finishing off! They remarked that whilst they can easily bench press the weight of the sleepers, they we much more difficult to hold than a 1inch steel bar! I didn’t say on that occasion that they were ‘soft’! For these situations we have just added to our attachments a sleeper grab. (pictured) This particular job took on some of the larger sleepers at 2.4metresX100mmX200 which were 120kgs. According to Andrew (the hiree) it worked a dream bringing his job down the home straight to the finish line. Not only that but it made the process much safer on both ones digits and backbone. The concept is pretty basic. The grab is open in the locked position. You place the open opposing plates over the sleeper that you intend to grab. The locking leaver is released and the kanga arm is raised. This brings the opposing plates together using the weight of the sleeper to secure it in the jaws of the grab. 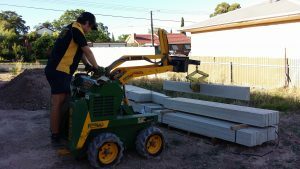 Travelling from your pile to the retaining wall with the sleeper is best achieved safely in the lowest possible position. Once at your ‘H’ iron for placement the arm is raised, sleeper is position and then lowered into place. 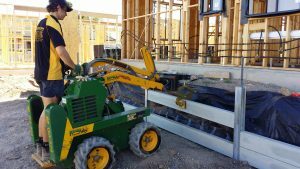 Once the level of the retaining wall takes the weight of the current sleeper, the grab automatically releases. Lock it open and you are ready to retrieve your next sleeper. There is an attachment for most jobs you can associate with hard work…except for shearing a sheep! 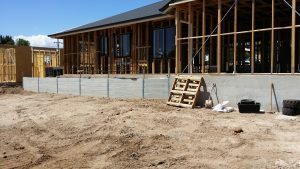 Make your next retaining wall job a breeze from augering the footing holes through to the sleeper placement. 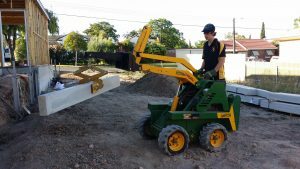 If you are searching for Adelaide Mini Digger Hire, U Kanga Do It has attachments to make every job easier. Take a look at the range of possibilities.